Cape May Tourism is what drives this great town. After all, it is the nation’s 1st seaside resort town. For many, many years people have been coming to Cape May in flocks for what it offers. The Cape May tourism frenzy started during the 1600’s, and probably even before, when this was a prosperous whaling town. People generally came from the Philadelphia area for a vacation. At the time, Philadelphia was the largest city in America. They 1st came by boat, land, and railroad. And continue to visit today. Cape May offers a bit of everything for everyone. With its beaches, restaurants, hotels, bed and breakfasts, sunsets, tours, arcade, mini-golf, whether you’re a kid or grown-up, this is a great place. And no matter when the season; winter, spring, summer, or fall, people come. The summer season is the ‘prime’ season. This is for the vacationers who love sunbathing and relaxing with a cool cocktail in their hand. The fall season is beautiful, as September may be the best month it has to offer with balmy days, warm ocean water, warm breeze, and less people. As September closes, October and November are big fishing months. The winter season is a popular attraction as people come to Christmas in Cape May during December. The town dawns its light on the gorgeous architecture. The spring is the calm before the storm. Cape May Tourism – What to do? Well, I guess we’ll start with shopping. 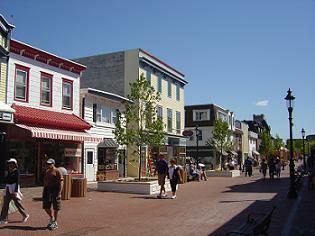 Cape May offers a wonderful outside shopping area called the Washington Street Mall. Several blocks are lined with various boutique, candy, clothing, and decorative style shops. All this mixed in with various eateries and ice cream parlors. This was once a road but has since been closed and now you are able to walk freely from shop to shop. You like ghosts? If so, you might like that Cape May is haunted. There are various tours that will show you all the areas and give insight on what has happened. If you would like some history on Cape May during a leisurely sight-seeing tour, while you rest in a carriage being drawn by a horse, this should be on your list. The horse and carriage ride will take you throughout the historic downtown area of Cape May while providing history about the town and various Victorian architectural buildings. Cape May offers the best dining along the Jersey Shore. You’ll be able to find anything you are looking for from fine dining, causal, to take-out. Everything is here for you to have a wonderful meal. Some of the fine dining restaurants would make large cities jealous. Cape May bird watching is a pastime for many as it provides the best bird watching in the region. Birds migrate to Cape May yearly and there are several bird observatories for you. And the biggest reason for Cape May tourism, the beach. And why not, the Cape May beaches are world renowned and have made it on the Travel Channel top 10 beaches. Come down during the warm months, June – September, and you can relax with sand between your toes, sun raining down on you, and a refreshing ocean to swim. Cape May Tourism – What to see? 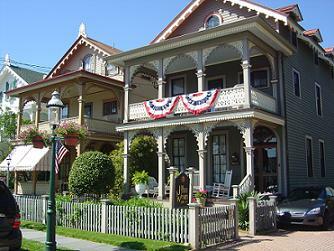 The Cape May Victorian architecture is also world renowned, as it is said that Cape May offers the 2nd largest collection of Victorian-era homes, only to have San Francisco offer the largest. These buildings throughout the town are beautiful to the eye, eye-catching as some would say. You can walk, ride bikes, or take tours throughout to sight-see these beauties. Many are converted into bed and breakfasts; however, some are people’s homes. Cruise around and you’ll feel like you went back in time. The Cape May Lighthouse is a historical landmark and located within Cape May Point State Park in Cape May Point. You are able to walk to the top of the lighthouse for a magnificent view. You’ll have a 360 degree look of Cape May Point, Sunset Beach, and even a glimpse of downtown Cape May. Cape May Point offers a beach referred to as Sunset Beach.. The name speaks for itself. Every night you get a gorgeous unobstructed view of the sun melting into the water. This beach is located on the Delaware Bay and is not a sight to be missed.